Born in former Yugoslavia, pianist Esma Pasic-Filipovic rose in prominence as a nationally award winning soloist at the competitions in former Yugoslavia, chamber musician, and recording artist for the national Radio Sarajevo. 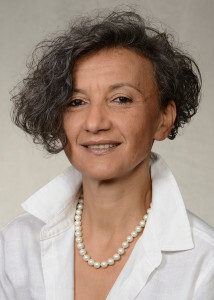 She received a Bachelor of Musical Arts in Piano Performance with Professor Arbo Valdma from the University of Novi Sad, former Yugoslavia in 1987. Post graduation, Pasic-Filipovic mainted a private piano studio and was the full time staff accompanist at the Music Highschool in Sarajevo. In 1988, Pasic-Filipovic served as the Director of premier PV Forum Multimedia Art Festival in the international Sarajevo’s Winter Festival. She returned to the University of Novi Sad and received a Master of Musical Arts in Piano Performance and completed post-graduate studies in the musicology department with Professor Walter Salmen at Leopold-Franzens University of Innsbruck, Austria in 1991. Ms. Pasic-Filipovic was working as a private piano teacher and faculty accompanist at the University of Sarajevo. Ms. Pasic-Filipovic permanently left her native country and immigrated to Austria in 1992. While living in Vienna, Austria, Pasic-Filipovic maintained a private piano studio, accompanied the private studio of Olivera Miljakovic, Soprano, and was a staff accompanist in the studio of Raphael Leone, Flute at the University of Music and Performing Arts in Vienna, Austria. She commenced an active performance career and concertized extensively as a soloist and chamber musician in Croatia, Denmark, Switzerland, and Austria to critical media acclaim. Ms. Pasic-Filipovic joined the piano faculty at Westminster Conservatory of Music of Rider University in Princeton, NJ in 1999. Her piano students have performed at the Weill Recital Hall in Carnegie Hall, NYC and the Kimmel Center in Philadelphia, PA and are prize winners at the regional and international levels. An active adjudicator since 2005, Pasic-Filipovic regularly serves for NJMTA, SMEA, AAFAA and Music Fest. Pasic-Filipovic joined the staff of Westminster Choir College of Rider University in Princeton, NJ as an instructor in the Professional Development Certificate Program in the Continuing Education Department. From 2016 she is a staff accompanist in the voice studio of Elem Eley, Baritone. Ms. Pasic-Filipovic has been the staff accompanist for the Westminster Conservatory Summer Flute Camp with Master Teacher, Gerald Carey from 2002. Pasic Filipovic is currently the Director of the Westminster Conservatory Honors Music Program, one of the premier college preparatory music programs in the country. In recognition of her diverse career, Pasic-Filipovic was honored with membership to the prestigious Bosnian-Herzegovinian American Academy of Arts and Sciences in 2010. Pasic Filipovic has continued an active solo and chamber career and regularly performs in the Westminster Conservatory Faculty and Nassau Series, and Steinway Series. In 2016 she has performed with the Westminster Community Orchestra Mozart’s Piano Concerto K488. She frequently collaborates with Katherine McClure, Flute, Larissa Korkina, Piano, Vladimir Valjarevic, Piano and Elem Eley, Baritone.